Nicolas Cage reprises his role as Johnny Blaze in Warner Bros.' new action-thriller “Ghost Rider: Spirit of Vengeance.” In this gritty new vision for the character, directed by Neveldine/Taylor (“Crank”), Johnny is still struggling with his curse as the devil’s bounty hunter – but he may risk everything as he teams up with the leader of a group of rebel monks (Idris Elba) to save a young boy from the devil… and possibly rid himself of his curse forever. “Ghost Rider: Spirit of Vengeance” is written by Scott M. Gimple & Seth Hoffman and David S. Goyer, with a story by Goyer based on the Marvel Comic. The producers are Steven Paul, Ashok Amritraj, Michael De Luca, Avi Arad, Ari Arad; while the executive producers are E. Bennett Walsh, David S. Goyer, Stan Lee and Mark Steven Johnson. Joining Cage in the cast are Ciarán Hinds, Violante Placido, Johnny Whitworth, Christopher Lambert and Idris Elba. 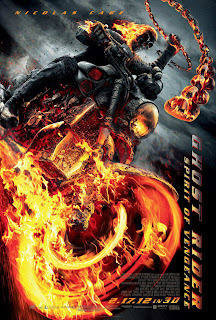 Opening across the Philippines on February 2012, “Ghost Rider: Spirit of Vengeance” is distributed by Warner Bros. Pictures, a Warner Bros. Entertainment Company.